This is my perspective on Karma that I have been promising for some time now. The essay "Overcoming Ignorance" by Jos Slabbert prompted me to present this essay on Karma that not only fits perfectly with the Taoist teachings of Lao-tse, "The Tao Te Ching" but also with the teachings of Jesus of Nazareth, "The Way". The two together clearly explain the Law of Cause and Effect, or Karma, which is the ultimate principle governing human existence. Karma is the ultimate principle governing our human experience in this physical world. It is the the law - the judge, the jury, and the "executioner" - that rewards us for our good actions and punishes us for our bad actions. Karma is what many religious teachings refer to as "Judgement Day", however, it is not a day but is spread out over our lifetimes. We are our own judge because each cause(action, thought, word) births a resulting effect which is the reward or punishment, depending on the cause. As long as we create causes, we will experience the associated effect sometime afterwards. Our Karma started sometime in the distant past at the time our soul first arrived in this physical world. No one knows when that moment occurred but for all practical purposes, it was many lifetimes ago. Each of us is born into this world in a state of perfection but facing a long list of effects that will manifest sometime during our lifetime. We have no choice but to deal with the good or the bad effects because Karma is absolute, objective, and guaranteed. As long as we create causes, the consequential effects must run their course. All causes and effects, Karma, take place in the material realm therefore we are bound to this world for as long as there are effects to be dealt with. This is why each of us is born to a Destiny that is predetermined by the effects left over from previous incarnations. 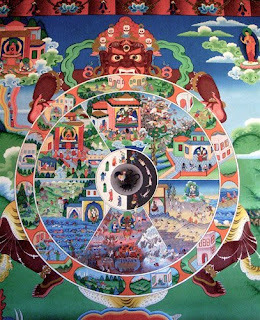 Hence, reincarnatiion is mandatory under the principle of Karma. Because we can not just choose to leave this world, we do not have Free Will. The choice we do have, though, is how we choose to deal with the events we are destined to experience. This is the key to our happiness and, for a few, the key to Destiny itself. The teachings of Lao-tse teach us how to master ourselves and return to our True Nature, Our Source, or God. I have studied the Tao Te Ching for about thirty years but have yet to find where it clearly addresses overcoming Karma. There are five chapters in the Tao Te Ching that pertain to achieving immortality* but the wording can be somewhat confusing. For clarity on this, I turn to the teachings of Jesus of Nazareth which he called, "The Way". This is where my perspective on Karma deviates from that of Jos Slabbert, the author of "Overcoming Ignorance". I have the greatest respect for his scholarly work but I just can not deny the whole point of the teachings of Jesus. By his own words, he exclaims that, "I have overcome this world". By any definition of the word "overcome", it means that he had been bound to this material world at some time in the distant past just as we are right now, however, he had overcome that which had bound him to this world - Karma. He accomplished the most difficult thing a human can do. He gained true Free Will, and escaped the grasp of this material world. The incredible thing about Free Will, is that he had the choice to come back to this material world to show us "The Way" to do what he did, overcome Karma. This is Not to be taken lightly! "The Way" is the absolute epitome of challenges that relatively few will ever conquer, yet it IS possible. Jesus exhibited the altruistic Love that is the essence of our highest level of existence when he chose to come back and show us "The Way". There is no doubt that it took many reincarnations, the eventual awakening we all must experience, the beginning of his Path with Heart, his complete mastery of self, a mastery of each and every moment in time, and a life completely lived in the objective Present. In other words, he stopped creating causes and his accumulated effects ran their course as he objectively flowed by each and every one of them. Eventually his accumulated effects reached zero, his Destiny ended, he was free from the grasp of Karma, and he overcame this world!! This is called "Heaven" by many Christian teachings, "Nirvana"* in Buddhism, "Moksha"* in Hinduism, and by many other names throughout the various cultures of the world. So where do we go when we die? This is probably the most thought about question in the world. This is where different perspectives of the One Truth eventually became the myriad of religions in existence today. The origins of each one arose in the same way as when ten people who witness the exact same event "see" ten different events. They all saw the same thing at the same time yet each person interpretted the event differently. Anyone who has taken Sociology 101 has experienced this phenomena with a simple exercise all Sociology professors use to demonstrate perception. Ironically, and sadly, this variance in perception of the One Truth has been, and continues to this day to be, the main reason mankind engages in war and hate. If only the religious leaders of the world would come together to examine the very core of their beliefs, they would eventually find this thread of Truth at the center of all religions. My what imaginations we have! So, religions aside, where do we go upon death? I can tell you what little I remember from the two "near death" experiences I had in 1975. There has been two times since then where I was faced with certain death and I "saw" again what I had glimpsed at the moment of my "death". I experienced the most incredible state of perfect peace, perfect calm, perfect silence, and exctasy infinitely beyond mere words. I saw, and was engulfed in, the most beautiful golden light. A light so bright yet so soothing, a golden light that wrapped me in complete security and sereneness, a light so powerful that I could not resist it's pull on me even if I had wanted to. Wherever we go to rest between reincarnations is what I would call Heaven. The Taoist sage, Lao-tse, wrote "Mourn a birth and rejoice a death". I completely understand this truth for it is here in this material world where all pain and suffering occurs from the moment of birth until the moment of death. It is completely up to us how we deal with the challenges of life on earth and whether the Karma we create manifests as pain or as pleasure. This is the one choice we all have. * (Tao Te Ching) Immortality, Chapters 16, 33, 44, 50, 52. * (Buddhism) Nirvana is the complete cessation of suffering; a blissful state attained through realization of no-self; enlightenment. Karma Rules So Why Try?